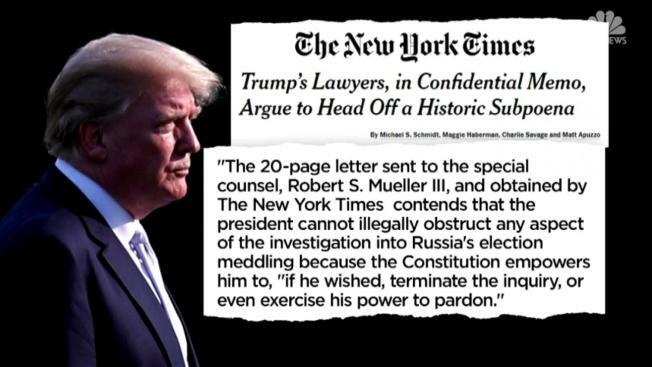 President Donald Trump's lawyers composed a secret 20-page letter to special counsel Robert Mueller to assert that he cannot be forced to testify while arguing that he could not have committed obstruction because he has absolute authority over all federal investigations. The existence of the letter, which was first reported and posted by The New York Times on Saturday, was a bold assertion of presidential power and another front on which Trump's lawyers have argued that the president can't be subpoenaed in the special counsel's ongoing investigation into Russian meddling in the 2016 election. NBC has not independently verified the letter.